Michel took both of these photos in Poland and then processed them with the tilt-shift method that makes the subjects look like toys or miniatures. The above bus stop is in Krakow; the photo at right was taken in Krynica. In addition to Michel’s photos on Flickr, here’s a link to his photography website; Michel lives in the Netherlands. 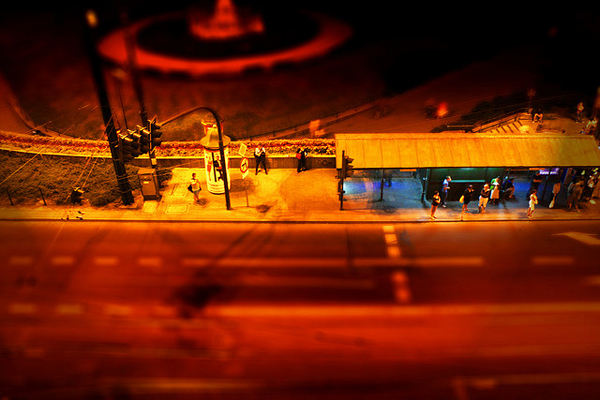 As for tilt-shift, Michel shot these photos with a Canon 1000D and processed them in Photostop. An easier way to go about it for amateur photographers is to use one of several apps available for the iPhone that has this editing function. I’ve had good luck with Instagram and Camera+. To submit a photo, post them to Metro’s Flickr group, email them to sourcemetro@gmail.com or Tweet them to @metrolosangeles with an #artoftransit hashtag. Many of the photos we’ve featured can be seen in these galleries on Flickr.